My work on this began three years ago when I introduced a series of motions calling for a comprehensive sidewalk repair plan that would address all broken, inaccessible sidewalks in Los Angeles. My partner in this work, Councilmember Joe Buscaino, and I followed up with 10 public hearings to study how best to implement such a plan. We discussed myriad policy options, heard comments from hundreds of Angelenos and considered a number of reports on the matter, which led us to the program we now have today. During that time, we also worked with city departments to begin repairing sidewalks next to city-owned properties, like parks, libraries and recreation centers, and the City Council created a sidewalk repair trust fund to house the $50 million budgeted for sidewalk repairs over the past three years. To date, we have repaired dozens of miles of sidewalks around public buildings in the San Fernando Valley and across the city. Starting right now, sidewalk repairs will begin in residential and commercial neighborhoods. These repairs will improve neighborhood safety, boost the quality of life and better connect our communities. Property owners can choose from several options that are available in the program, and we encourage Angelenos to participate and help us renew our pedestrian grid. Because the plan will stretch over three decades, we recognize that some property owners may want to get their broken sidewalks fixed as soon as possible. The new Rebate Program will provide up to $2,000 to homeowners and $4,000 for commercial property owners who want to repair their own sidewalk. Rebates will be offered on a first-come, first-served basis for the next three years. Applicants will get their sidewalks inspected by the city, will receive a rebate offer and will then be responsible for repairing their sidewalks. People who want to take advantage of the Rebate Program can start the process by visiting www.sidewalks.lacity.org. Another key piece of the overall program is Access Request. This program will take complaints and make repairs requested by people with a mobility disability who encounter physical barriers, like broken sidewalks, missing/broken curb ramps or other barriers in the public right of way. To request a repair through the Access Request Program, call the Department on Disability at 213-202-2685 (voice) or 213-202-3452 (TTY). Residents who do not qualify for either of those programs should still report broken sidewalks and request repairs at www.sidewalks.lacity.org. The city will repair all broken sidewalks over the course of the 30 year program. I also pushed hard to make the plan environmentally sustainable and, because of these efforts, the city will make every effort to protect mature neighborhood trees when repairing sidewalks and, if trees must be removed to complete a repair, they will be replaced at a 2 to 1 ratio. Using alternative materials on sidewalks that maximize groundwater infiltration and make parkways more sustainable and resilient is also part of the plan. With this new and unprecedented commitment to repair LA's sidewalks, we are making good on our promise to improve the city's neighborhoods without burdening home and business owners. I hope you'll agree that this plan is a monumental step forward for our city. 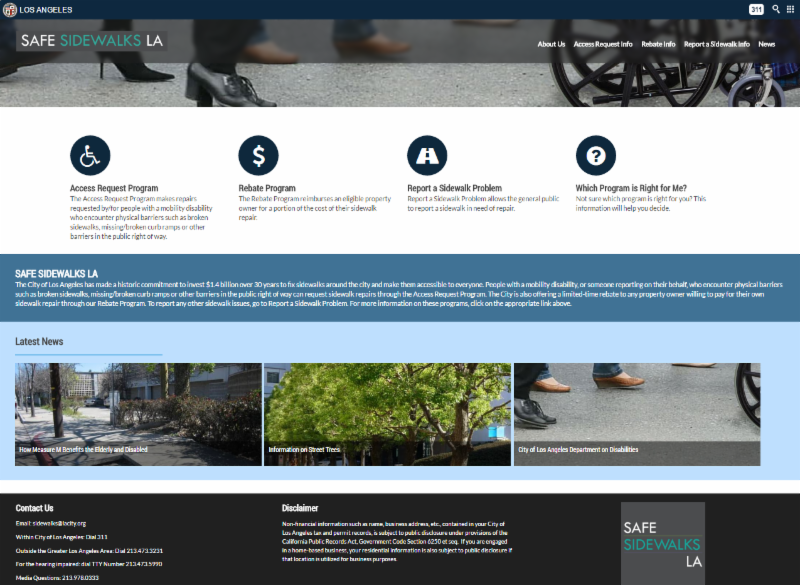 If you have questions about Safe Sidewalks LA or want to apply for the rebate, visit www.sidewalks.lacity.org.